Dental anxiety can be a real problem. In fact, it is estimated that about 5 to 8 percent of adults avoid dental exams because of a fear of dentists. The degree of fear can vary. 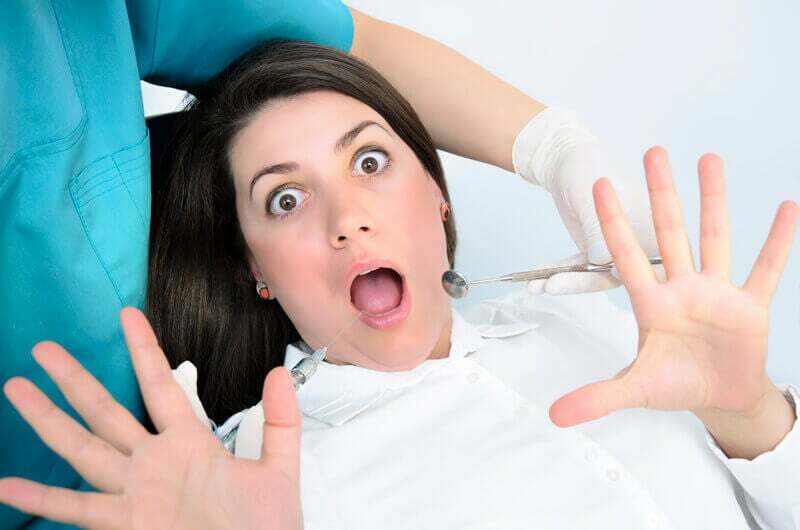 You might have a general unease about visiting the dentist or perhaps you experience a complete panic attack at the thought of going to the dentist. When this dental anxiety prevents you from seeking the dental care that you deserve, then you have an issue to deal with. Avoiding teeth cleanings and regular check-ups could increase your risk of gum disease and other dental problems. Regardless of the severity of your dental anxieties, it is possible to get over your fears. The first step is to acknowledge that you have a dental phobia. It is hard to overcome something by ignoring it. There are many reasons why you might be afraid of the dentist. For example, you may have had a bad experience at the dentist in the past. Or, maybe you’re afraid of the lack of control. You could also have an underlying anxiety disorder. Yet another common reason is the current state of your teeth. If you’re worried about the possibility of surgery or the presence of cavities, you may hold off on scheduling an appointment. But, the longer you avoid the dentist, the worse these problems can become. After acknowledging your anxieties, the next step is to discuss them with someone else. This could include family, friends, or co-workers. You may even find that you’re not alone with your fears. Also, hearing your anxieties discussed can help ease some of the tension. Simply addressing the problem can help you realize that you have an irrational fear. Along with friends and family, there is someone else that can offer even greater help in easing your fears. The person best equipped to put you at ease is your dentist. There are even dentists that specialize in treating patients that suffer from dental phobias. Every dentist wants their patients to be comfortable. This means that they’re willing to work with you to ensure you have a pleasant experience. If they are aware of your concerns, they can take steps to make your visit more comfortable. For example, providing a more thorough explanation of each step of a dental procedure may be beneficial for those that are afraid of the lack of control. For those that fear surgery, understanding that no surgery will occur during your initial consultation can be reassuring. There are ways for dentists to help make you feel comfortable and relaxed. But, they can’t assist if they don’t know about your anxieties. Do not hesitate to bring these fears up when you schedule an appointment. As mentioned, the root of your anxiety could be related to an underlying anxiety disorder. If you tend to feel anxious in similar situations, such as having to wait in a waiting room or if you have a fear of offices, then you may suffer from general anxiety. To address an anxiety disorder, additional help may be necessary. A visit to your general physician could help point you in the right direction. In many cases, a general anti-anxiety medication prescription from a doctor is enough to quell anxieties. If not, your physician can provide you with a referral to a psychiatrist or therapist capable of helping you with your anxieties. The main point is that dental anxiety is relatively common. You first need to acknowledge your fears and consider the root cause of your anxieties. From there, you can determine the best way to deal with your phobia. And, one of the best solutions is to talk to your dentist about your fears. Your dentist can help explain any dental exam, treatment, or procedure that you require. They can show you the equipment that will be used and help make you feel more comfortable. In the end, if you want to get over your dental anxieties, your best option is to schedule a dental appointment.